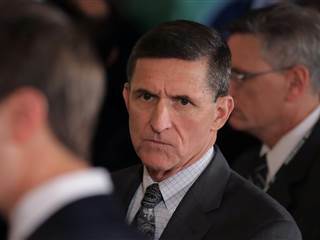 This week, General Michael Flynn stepped down from his post as National Security Advisor to President Trump after it was revealed that he talked to the Russians, possibly about sanctions. Flynn served the shortest ever term for a White House employee, just three weeks. The question that now remains is how many others, if any, in the White House, and maybe stemming back to the campaign, have had contact with Russia. Trump, in his press conference today, stated that he has no deals and no debts with anyone in Russia and the reason Flynn left the administration was because he lied to Vice President Pence. See other news featured by AllSides such as Andrew Puzder Withdraws, Trump’s War with Intel, Controversy Over Healthcare and the latest AllSides News. "Michael Flynn’s resignation as national security adviser is shifting the balance of power between President Trump and Congress, with Republican senators vowing to more aggressively exercise oversight of the new administration and Democrats seizing an opportunity to ask pointed questions about Trump’s ties to Russia. 'It is now readily apparent that General Flynn’s resignation is not the end of the story. It is merely a beginning of a much longer story,' Senate Minority Leader Charles E. Schumer (D-N.Y.) said on the Senate floor." "The story begins before the Trump administration even took office, as the outgoing Obama administration was wrapping up a last bit of ugly and difficult business. On Christmas Day, before Obama announced his punitive measures against Russia, Flynn communicated with Russia's ambassador to the U.S., Sergey Kislyak. That they talked is not in dispute. The issue is what they said. The Washington Post reported on Thursday that their discussions included, if not a warning by Flynn about the pending new sanctions, a promise that whatever Obama did, Trump could undo once he was in office. If Flynn was negotiating with the Russians on behalf of an administration not yet in power, that could technically be against the law — though it's a law no one has ever been prosecuted for breaking, the Logan Act. The conversations also expose the Trump administration to more charges about secret collusion with Moscow." "For now, the so-called deep state — the intelligence operatives and highly placed officials who run the United States government because they have the power to ruin their opposition — would apparently prefer that we not hear the tape. Many of them are Obama functionaries who are content to shape opinion by leaking their edited version of events to media allies. Some of them are Trump functionaries whose mishandling of what may be a tempest in a teapot has made them vulnerable less than four weeks into the new administration. Perhaps, they calculate, handing up Flynn’s scalp makes their problem go away. In reality, it is just whetting the opposition’s appetite. Let’s end the intrigue and go to the tape."